By now I’m sure you’re all aware of what might be happening on August 21, 2017 at 2:47p.m. (est). Yes, that exact time. If you’re not sure what’s going on on that date, you’re in for a treat. For the first time in thirty-eight years, a total solar eclipse will be visible from the continental United States, stretching across 14 states, including right here in the Holy City. Luckily Charleston sits right in the “path of totality”. If you’re like me, you might be wondering what the heck that even means. Right? Essentially right at 2:47p.m, the moon will orbit directly in front of the sun, blocking its path to Earth. The moon will cast a shadow onto Earth causing complete darkness. Fact check me all you want, but I do believe this is a once in a lifetime "holiday" for Lowcountry livers. Between school and work closings, hotels discounts, and special offers throughout the state, make sure you plan your Eclipse getaway before it's too late! For more information on what an eclipse is, what to expect during, how to take that perfect eclipse Instagram pic (I’m not kidding! 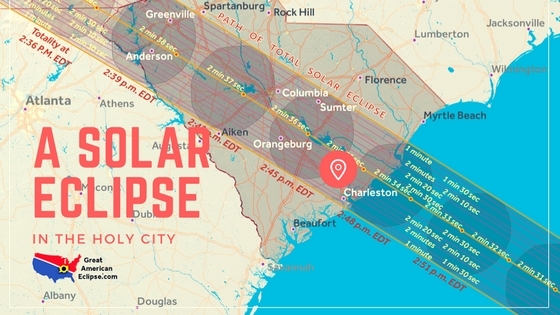 ), popular viewing spots in the city/state, some fun facts, and a LIVE countdown until the event, visit charlestonmag.com/eclipse/. Illustration by Jude Shiflett and can be found in the Total Solar Eclipse guide of Charleston magazine's July issue. // Cover image courtesy of Great American Eclipse.